The inbound marketing movement has led to lots of interesting discussion around sales approaches. That's understandable - after all, as buyers have more tools at their disposal to self serve and avoid sales people, it's reasonable that more than marketing needs to change. Foresightful companies are creating a continuum of prospect experience with an inside sales person as the quarterback. That's a tall order though. Org chart changes have to be CEO driven - and most of the work I see underway in companies is intra vs. inter departmental. In other words the marketing department recognizes they have to adapt to digital and undertakes to do so. But the sales department, with a different perspective, leadership and priorities continues down their narrowing path. That's creating lots of waste and inefficiency - and companies can ill afford either. Let's unpack each of these quickly. Great digital marketing (built on qualitatively sound personas, rigorous understanding of buyers' journies and quality content built for each persona/journey stage) creates lots of leads. Newsflash! Not all are sales ready! Some will never be! In the Age of the Seller (love the term from @JimBlasingame), leads were either qualified (budget, authority, need, time defined) or not. But in the Age of the Buyer, the research and education process results in digital marketing contacts well before they're leads. Yet many companies hand these off to their field sales and even channel sales...who then alienate the contacts and bemoan the poor quality of leads. That's led to even sharper instructions to sales teams to rigorously qualify leads to only spend time on those which might actually close. And that's a clumsy response which belies a B2B sales myopia. Instead of viewing the abundance of leads as chafe from which sales people must separate the wheat, a more appropriate response is to view those leads as a long-term asset which must be properly developed - like talent, for instance. With that perspective then marketing automation can be used to intelligently and effectively segment and nurture leads. Combined with savvy inside sales teams, complex marketing automation can not only bring many interested contacts to the lead stage, but transition them to sales at precisely the right time. Both approaches result in sales teams working on the right leads - but the classic approach squanders a hard won asset while a more enlightened approach, which carries an incremental cost of nearly $0, nurtures that asset. I love process....and I hate it. Developing a process which fosters efficiency while eliminating opportunity for error/defect is satisfying. Implementing it every day, however, is something for which I am ill suited by temperament; I marvel at those who not only enjoy it, but draw strength from that activity. Unfortunately process also provides a crutch for those hesitant to change and a cudgel for the passive aggressive types determined to resist it. I see this commonly in organizational silos when IT, PR, Marketing, Sales & Customer Service are accustomed to doing things "their own way." A process, for instance, for routing leads that was developed during the Age of the Seller is simply ill suited to today's markets. Period. What Jenny always does, or what Pete prefers to do are patently irrelevant. You know longer put a "While you were out" hand written message in someone's message box - and you should no longer route a lead according to the same rules which were appropriate when you did. Similarly, any sales & marketing website which is controlled by any department other than revenue growth is counterproductive and a vestige of an outdated process mentality. Sites used to be built with unwieldy and complex code. Today they are WYSIWYG. Sure, if you've got a complex SaaS site or database connections and robust ecommerce, that's different. And managing MX records and DNS hosting may be better suited to someone from the IT realm. Outside of those technical areas, there's nothing that IT will do to enhance the outcome, nor will they add any expertise critical to revenue growth success. All IT contributes to a typical B2B marketing & sales website is sclerotic processes. And PR that doesn't embrace the power of optimized content, SEO, inbound links, distribution & promotion and strategic goals, largely fails. Now, I'm not saying just "blow the whole thing up" - change management and empathy are necessary to effect lasting change. But if you allow outdated processes to constrain your revenue growth development over a window longer than six months, you're failing your responsibility to the business. Inbound marketing was supposed to democratize marketing and enable small companies to compete against large companies with huge ad budgets. The good news is that it has. Examples like River Pools & Spas are proof positive. The bad news is that it often fails. Not only does it take a lot of work, but it takes the right work. Too often practitioners (companies AND EVEN marketing 'agencies' and 'consultants') subscribe to a checklist approach. Now, process is important. Following best practice tactical steps routinely is fundamental to the consistent, incremental improvement which is an important component of long term inbound marketing success. After all, if you attract 5% more visitors, convert 2% more of those to leads, and successfully nurture 20% more of those to customers, the power of compounding is significant. But that's like a performance tune up on the engine - first you've got to get the cylinders cycling. That takes vision. If it was simply a function of frequency of publication, why wold some frequent blogs have no traffic? Why would twitter accounts with 5 tweets every day....have zero engagement? Checklists are to avoid missing details - they're no substitute for business savvy, vision and understanding of buyers and markets. What's behind these obsessions and counterproductive inclinations? 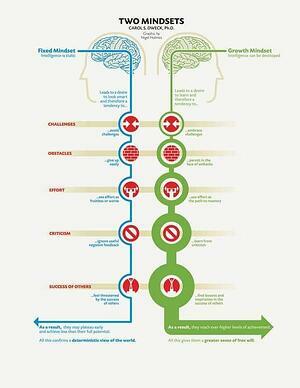 Mindset. The premise is that folks with a "fixed mindset" prefer to look smart, and will "stick to what they know" to avoid stumbling. 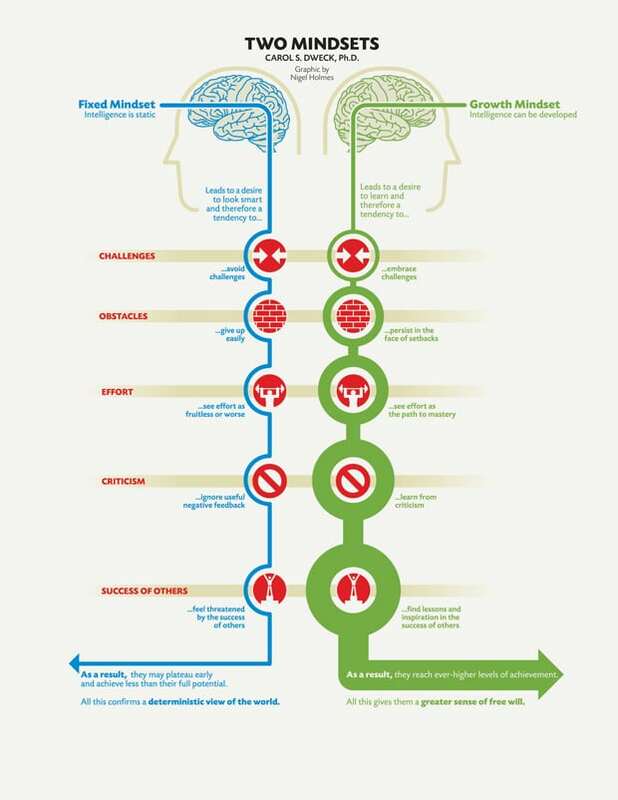 In contrast, those with a "growth mindset" will learn, fail, look silly and believe that their potential progress is without bounds. 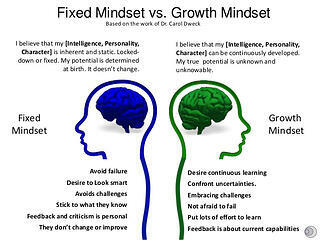 In my experience most inhibitors to to B2B revenue growth can be traced to fixed mindsets. Every revenue growth team needs administration. Someone needs to run payroll, someone needs to proofread (especially anything I've written!) and someone needs to ensure that there's paper for the copier. But there's a huge amount of energy that get's expended peeing on fire hydrants, filtering out leads that should be nurtured, trying to reconcile conflicting and counterproductive processes and producing crap to satisfy checklists rather than provide value to prospects. Think of your revenue growth activities like this. They are either focused on internal issues or prospects/customers, and they are either process focused or sales/outcome focused. 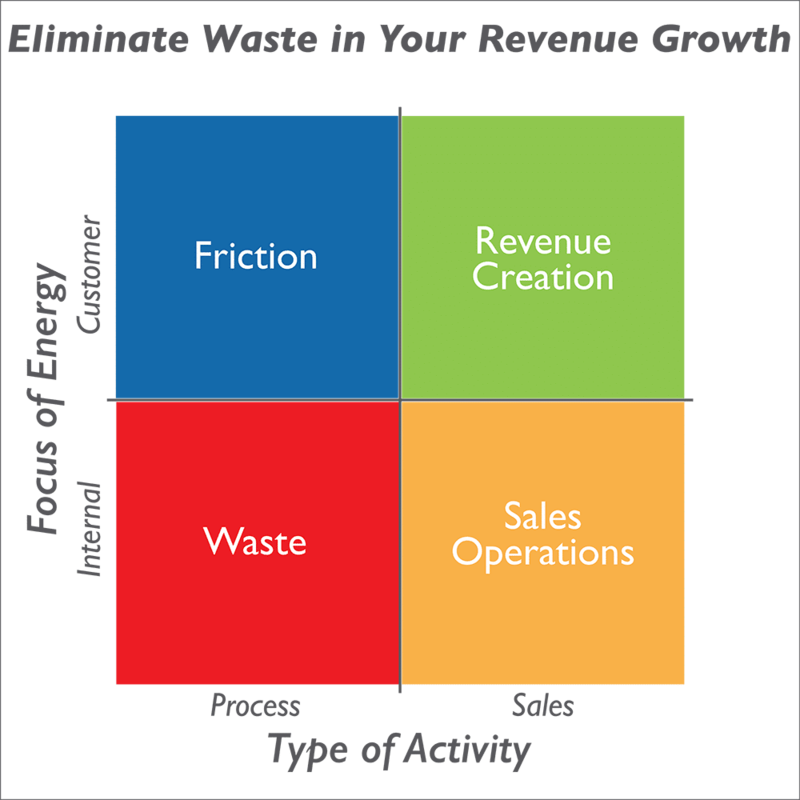 What percent of your revenue growth resources are actually focused in the upper right quadrant? Probably a precious small piece. But would you even be able to determine that easily? Probably not - and that is precisely why strategic revenue growth iniatives often require outside expertise to implement. Getting this right requires change. American manufacturers that ignored management science failed - those that embraced it went through the challenging process of implementing quality and efficiency programs that allow them to compete globally. Download this guide for a step-by-step introduction to the process.